Len says: "A dark, brilliantly-written novel full of twists, turns, and heartache. Police officer Elizabeth Black finds herself in the center of a maelstrom as state attorneys attempt to indict her for the murder of two depraved sociopaths while she was in the line of duty. At the same time, Adrian Wall, another cop and the man who saved Elizabeth's life, is about to be released from prison, where he served a thirteen year stint for an alleged crime of passion. Hart weaves these two storylines into a gruesome, often chilling, and entirely gripping crime novel that will have you on the edge of your seat all the way to the spectacular ending. (SIDE NOTE: I listened to the audio version of this book. Scott Shepard's narration might be the best I've ever heard.)" Over 2 million copies of his books in print. The first and only author to win back-to-back Edgars for Best Novel. Every book a New York Times bestseller. Since his debut bestseller, The King of Lies, reviewers across the country have heaped praise on John Hart. Each novel has taken Hart higher on the New York Times Bestseller list as his masterful writing and assured evocation of place have won readers around the world and earned history's only consecutive Edgar Awards for Best Novel with Down River and The Last Child. Now, Hart delivers his most powerful story yet. 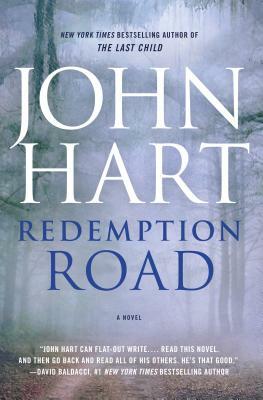 Brimming with tension, secrets, and betrayal, Redemption Road proves again that John Hart is a master of the literary thriller.